I happened to have caught the movie, Kramer vs. Kramer, the other day. I had first seen this movie when I was a young teen, too young to really understand its significance at the time. 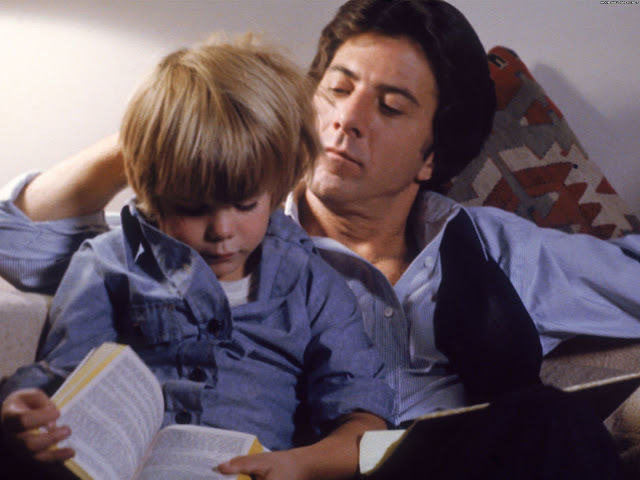 As a single, adoptive father now deep in the throes of parenthood, I found Dustin Hoffman’s portrayal of having to abruptly handle the single parenting of his only son particularly riveting. That early scene in the movie, the morning after his wife had left him, where he botched the normally ordinary task of getting breakfast together for he and his son was a tribute to the then pervading societal views of a father’s ineptness in caretaking. Although entirely my desire and choice, and with much preparation beforehand, it too was a shock for me to essentially have woken up that first morning suddenly a single father, who was solely responsible for the life of a child—although make that a pair of brothers for me. The movie came out in 1979… thirty-five years ago. It was interesting to see Dustin’s Ted having to repeatedly face society’s narrow-minded perceptions of a father’s place in caring for his children. In many ways, all these years later, such perceptions have not necessarily changed all that much, as I had first encountered on my own in seeking to adopt a child as a single prospective father. Even now, four years into life as a single father, although perhaps more so in reaction to my own self-consciousness than what I actually experience, my role as nurturer still sometimes leaves me feeling a bit in doubt in comparison to societal stereotypes that favor the motherly role in child rearing. The most poignant scene for me was where Ted threw, I mean tossed his son into bed out of frustration over his unrelenting defiance, and unabashedly answering, “I’m all you’ve got!” to his son’s pleas for his mother. Good, bad, or indifferent, I too am all my two sons have. As depicted in the movie, over the better part of a year, it was enthralling to watch Ted transform from an insecure, uncertain, forced upon full-time single parent to one who was in charge, secure, confident, and absolutely committed to his son. This could not have been played out more beautifully than in the scene on the morning his son was supposed to return to live with his mother, as ruled by the courts nearly a year later. Seeing Ted and his son preparing breakfast together, and how father and son now seamlessly worked together in a way that conveyed their sense of belonging with each other was a sight to behold. I vividly recall, for our first anniversary together as a family, being in awe as I compared myself to how I’d evolve from where I started. Like Ted, I became much more open to life as it was, rather than what I thought it should be. And in so doing, I have become a better adoptive parent… one who is more in tune to my sons’ needs, and subsequently, better able to meet their needs. Our relationship together as father and sons continues to deepen over the years. Fatherhood encompasses my every being in ways I had never really thought about before; parenting single handedly actually enhances my fatherly role exponentially. In actuality, I am all I’ve got; yet, along the way, I found out even more just how much there is of me to give. Society, in turn, also has been recognizing and supporting my ability to parent and nurture my sons’ innate goodness, as they mature and set out to make their mark in this world, when previously for them, there wasn’t even the thought of a possibility for that chance. Dr. Gary Matloff is a licensed psychologist, and a proud single, adoptive father to a pair of brothers, now thirteen and sixteen years-old. He is the author of See You Tomorrow… Reclaiming the Beacon of Hope— A true story about resilience, and the journey of a lifetime for a pair of brothers and their new father against the sometimes all too uncompromising reality of adopting older children and international adoption.